A comprehensive step by step tutorial of Ionic 3, Angular 5 and Sort List of Data with working example. Almost every Ionic 3 or Angular 5 application that has a list need to searching and sorting the list. We will build the searching and sorting of the list of data that loaded to an array. We will use same API call as the previous tutorial for load Country list. The main purpose of this tutorial is to populate existing data using Angular pipes. There are ready to use Angular pipes modules, but we will create our own from scratch. Before starting with the main steps, make sure above tools, frameworks, and modules are up to date. For Node.js you check and compare your local version with the recent recommended on the official site https://nodejs.org/. To check your local version type this command on the terminal or Node.js command line. Now, update the Ionic 3 version by type this command. To create a new Ionic 3 and Angular 5 application, type this command. If there's a question like below, just type `N` because we will not use Cordova right now. The Ionic 3 app created and automatically installing Node modules. Now, go to the newly created Ionic 3 app folder. 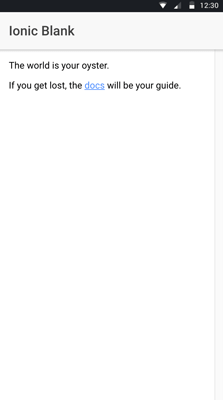 As usual, to check app just run the app in the browser after type this command. You will see the page below in the browser if everything still good. As we said at the beginning of this tutorial, we have to load all Country data from free API to an array. Before populating any data from API, we have to add `HttpClientModule` to `app.module.ts`. Modify `src/app/app.module.ts` then add this import. Also add `HttpClientModule` to `@ngModule` imports. The `HttpClient` is ready now to use for calling RESTful API. Next, type this command to generate a service or provider. Next, modify `src/providers/rest-api/rest-api.ts` then add this imports. You will see in the provider file there's `HttpClient` already imported and injected into the constructor. Now, add string variable for URL before the constructor. Create a function for get Countries data from RESTful API. Also, create functions for handling and extract response and catch error. Next, modify `src/pages/home/home.ts` then add this import. Inject that class name to the constructor, so it will look like this. Add these variables for holds Countries data and error message. Now, create a function for call get countries from REST API provider and set the response to countries variable. To load that function when the page load, call `getCountries()` function inside this load function. Now, display the data in HTML by modifying `src/pages/home/home.html` then replace all tags with this. 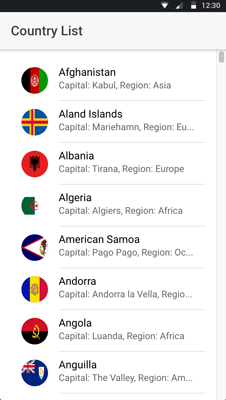 Run again the app in the browser, you will see the list of all countries. For searching and sorting countries data, simply just create the pipes. Type this command to generate pipe. That command will create `pipes` folder, search and sort folders and files. Now, modify `src/pipes/search/search.ts` then replace default `transform` function with this. Next, modify `src/pipes/sort/sort.ts` then replace default transform function with this. To implements search and sort pipes, first register that pipes in `app.module.ts`. Modify `src/app/app.module.ts` then add this imports. Then add in `@ngModule` declarations array. Next, modify `src/pages/home/home.html` then add search box component and a button for sorting. Add the filter into list item array. Modify `src/pages/home/home.ts` then add this variables before the constructor. Finally, add the function for sorting. 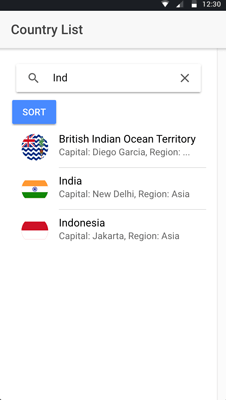 Now, you can test sorting and searching by run again the app in the browser. That's it, you can find the full source code on our GitHub.